Spring Session 2: 8 WEEKS! All adult pottery classes focus on wheel throwing techniques and accommodate skill levels from a total beginner to very advanced pottery veteran. Our small group size ensures individual guidance and ample time with the instructor to address any questions our students have. Various throwing projects, glazing and surface techniques will be explored in all of the classes. Each one of our instructors is prepared to help you with getting started with the very basics or to consult while developing your own individual pottery style. When registering for a pottery class, please choose the class day and time that fits your schedule for the entire session. Details about missed class, make-up policy, and firing fees are below. This includes first $25 in firing fees, any additional fees due at the end of session. 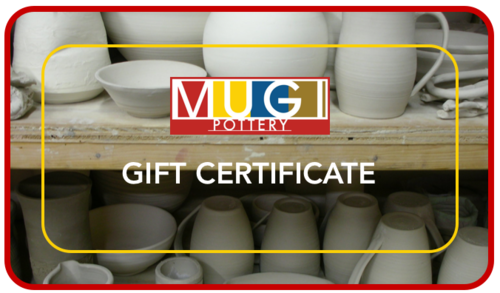 Students may make up missed classes at any other class time during the same session by emailing info@mugipottery.com to inquire about available spaces. $25 Firing fee deposit is included in the cost of the class for all adult classes. Fees may not be transferred to another session. A fee of $.04 cents per cubic inch will charged to fire work, this is one fee for both bisque and glaze firings. No Refunds will be given once the session begins. $75 nonrefundable deposit required at the time of registration. Class Fee includes one two hour class a week, all materials, towel, use of studio tools and practice time during scheduled hours.